[I have long recommended the acquisition of gold bullion as opposed to numismatic gold coins. I still do. But here, FTW Senior Staff Writer Jamey Hecht poses some well-constructed arguments explaining why the “hybrid” Swiss 20 franc piece has become a very attractive option these days. I call it a hybrid because it is both pure bullion and a numismatic coin at the same time. That fact is what just might save your holdings, if and when things deteriorate to the point where Uncle Sam comes looking for your gold. In doing so Hecht presents one of the most cogent pro-con analyses of the likelihood of government confiscation of gold I have seen to date. For that reason alone, this article is very important. But a gold confiscation in the 21st century would look and feel vastly different from the one seen in 1933. Gold confiscation by the state is always an act of utter desperation that cannot be hidden from the outside world. It would be as if the US were saying, “Everybody get out of the way, we’re going down.” If the US government did move to seize privately-held gold it would happen only when the fabric of American social and economic life had been torn to shreds already. It’s anybody’s guess as to what other “complications” we all might be facing at that point. Nonetheless, this article makes good points as to why that confiscation has better than a 50-50 chance. But it won’t happen for some time. Two to five years would be my guess, if at all. So I have modified my position a bit. I have always recommended Swiss francs in a precious metals mix, but I think for a while, that’s all I’m going to buy. July 7th 2006, 10:32am [PST], LOS ANGELES - There’s an ongoing debate about whether the U.S. Government might ever repeat FDR’s 1933 confiscation of privately held gold. It raises the secondary question of whether such a confiscation would exempt rare (“numismatic”) coins, as the Roosevelt confiscation did. The debate is important because it’s a major factor in the buying and selling of gold in today’s environment. Eminent domain has been expanded to include corporate claimants to private assets; under the Patriot Act, the Fourth Amendment has gone the way of the 8-track tape; and without a bankruptcy escape hatch, the post-housing bubble future is beginning to look like indentured servitude. Though the paper fiat dollar has not yet burst into flames, the debt temperature is so high these days that you can almost smell the first serpentine wisp of smoke rising from Ben Franklin’s face. Every time I see that paternal frown on the hundred dollar bill I hear Franklin telling us which form of government is the best: “A republic… if you can keep it.” Translation: I told you so. Full disclosure: while I continue to proudly hold the post of Senior Staff Writer at FTW, I have recently signed on as an Account Executive at Goldline International. There I help supply the investing public with gold and silver in advance of the looming hyperinflation that threatens everyone’s life-savings in the shadow of Peak Oil. At Goldline we sell both numismatics and bullion; while I believe that both are essential parts of a precious metals investment portfolio, I’m especially enthusiastic about investment grade coins. Let me share my reasoning. Unlike the Great Depression, ours is a time with no official link between gold and the banking system. When gold made its great bull run in 1980, the banks did not collapse. Without the gold standard, gold is irrelevant to the fate of the banks. The only reason to confiscate in 1933 was to save the banking system; since gold was legal tender and paper was redeemable for it, depositors wanted to run on the banks in an effort to retrieve their gold. So FDR declared a bank holiday and outlawed the private possession of gold. A gold confiscation would be the loudest possible signal of the dollar’s death. It would represent financial suicide for whatever U.S. administration enacted it. A gold confiscation would be meaningless if voluntary, but would be state terrorism if mandatory and enforced by violence. Because of the 2nd Amendment and U.S. domestic gun ownership, it would represent both political suicide and social upheaval for whatever U.S. administration enacted it. Regarding points 1 and 2, a gold confiscation could happen after the dollar collapse, as the foundation of a new gold standard. A broken dollar would leave millions of working class and middle class Americans (i.e., nearly all of us) destitute, their assets seized by banks whose masters have been moving their own funds into foreign currencies, offshore accounts, and precious metals for the past ten years. Middle class persons with gold would have to surrender it to amortize their debt. But persons wealthy enough to own bullion without debt might be instructed to surrender it as their patriotic duty toward a nation in financial peril. Unlike the 1933 confiscation, this one would not be designed to prevent a run on the banks and initiate devaluation. It would occur after the dollar is dumped by foreign central banks and the United States defaults on its debt. At that point, there is tension between two claimants to US public and private gold: foreign holders of American debt, who would prefer to be paid in gold than in worthless Treasury Bills, and the privateers of Wall Street and the bullion banks, who have long been anticipating a massive wealth transfer in a post-dollar economic breakdown. While the game of trying to figure out what in the world the “strong dollar policy” really is has gotten increasingly Orwellian, the basics are pretty simple. We have kept the dollar's value high relative to other currencies - and far above what fundamental economics would warrant - by asking the consumer and taxpayer to shoulder extraordinary and rising levels of debt financed by increasing amounts of dirty money. This has enabled elites to move off shore and into private hands virtually all the real financial equity in the country. The US is not alone in experiencing "disappearing equity" - it is part of a global equity-centralizing and asset-control process. Consider that boldfaced point about the rigging of the gold price by central banks who dis-hoard their reserves whenever the dollar looks shaky. It would make sense to continue that game only so long as the magic printing press still functions; once the world refuses to put up with new American debt, the people who suppress the gold price would do a lot better to own the gold and watch the currency fall. Bullion confiscation is the old-school approach, and if there’s enough privately held bullion to warrant it, it might be used again. It isn’t the big government muscling in on the multitude of private little folks. It’s a few private huge folks using the government as a conduit through which to expropriate the wealth of the multitude of private little folks. This brings us to the alleged unfeasibility of a confiscation. Readers of Crossing The Rubicon will recall that the Patriot Act was part of the desiderata of 9/11. All the constraints of the Bill of Rights, the Posse Comitatus Act, the statutes that resulted from the Church Committee Hearings on domestic spying – all of it vanished when that legislative monstrosity dragged its slimy underside across Congress’ sleeping heads. So huge an expansion of the domestic police state does not occur for nothing. Sure, it’s hard to imagine DHS swat teams on house to house searches for privately held gold. It’s also hard to imagine FEMA detention camps for US citizens, and yet, as Peter Dale Scott wrote earlier this year, “A Halliburton subsidiary has just received a $385 million contract from the Department of Homeland Security to provide “temporary detention and processing capabilities.’” Given the amazing reach of PROMIS-derived datamining and surveillance software, it might not be so very difficult for a sufficiently ruthless executive to dispatch goons to the right houses. The stunning successes of America’s most inane domestic psyops – Lee Harvey Oswald the Marxist; Vietnam-era antiwar protestors framed for spitting on soldiers; Kuwaiti incubators; Osama bin Laden miraculously neutralizing the entire USAF; fake WMD; fake elections – make it easy to imagine Herr Rove framing gold hoarders as terrorists of some kind. Indeed, just refer to the gold as “meth,” and you can raid all the houses you want. Then there’s the question whether a 21st Century gold confiscation would spare the owners of rare coins the way FDR did. At one end of the spectrum of possibilities, nothing would be exempt from government seizure; if the convergence between military, police, and organized crime (described by Dmitry Orlov in the above slide) is great enough, clearly nothing will be in anybody’s secure possession. But consider this: if the authorities were to confiscate numismatics (as FDR did not), they would surely not melt them into bars, since their historical value might still fetch them a higher price on an international market than would their mere metal weight. So a confiscation of numismatics would be a state theft of art, comparable to the Nazi seizure of paintings from Jews, e.g., Klimt’s “‘Portrait of Adele Bloch-Bauer,” which wasn’t looted for the paint, wood, and canvas. Numismatics can’t be melted down without losing a good part of their value (and the more valuable the coin, the greater the portion of its value that lies beyond the “melt value” of the metal). When circulating gold coins were confiscated in 1933, they were melted down (that’s how the surviving coins became numismatic – they became rare). What they can’t melt, they can’t use. I used to doubt that the DHS agents would use their flashlights to check which coins are bullion and which are numismatic before they shoved it all in a black bag and got back in the helicopter. Confiscation seemed impossible, because of the scale of state violence required, and numismatics seemed just as vulnerable to it as bullion, because that violence (if it ever happened) was unlikely to make distinctions. I changed my mind about both points for one reason. Grant Marylander, Vice President of Goldline pointed out that taxation is a much more effective means of confiscation than raiding could ever be. How? Decree that all bullion be handed in for paper cash, as in 1933. Watch the majority refuse, as in 1933. Then, this time, use the vast arsenal of data that pinpoints every 21st Century citizen’s every sneeze: tax the sale of bullion at 50%, and the government’s cash-for-bullion swap suddenly seems like the best option. Bullion on a black market would be just as hard to sell without getting cheated. What you’re unable to sell, you don’t really own. To sum up, I think gold confiscation is more than possible, because the dollar will collapse. I think such a confiscation will exempt numismatic coins, because they present special difficulties: the government has a harder time finding them without the paper trail that bullion generates; the government would have to appraise each rare coin, preserve its condition, and organize its indexable storage, whereas bullion can be dumped in a furnace and melted down with no extra labor or expense; and because numismatics don’t represent a significant portion of existing gold (if all the world’s bullion is the size of the Washington Monument, all the numismatic gold is a little house at its foot). Exquisite, rare numismatics are for collectors. They’re connoisseurs who appreciate the physical beauty of their coins, the historical aura of a portable work of art that previous generations handled, and the pride of ownership in an ancient tradition. But in a broken society, a one-ounce Saint Gaudens twenty dollar gold piece in a high mint state (retailing today at, say, $5,000) may not be readily convertible to an appropriate quantity of groceries. In a future where bullion is confiscated, numismatics are impractical, and the dollar is wallpaper, what are we to use as money? I can trade shoes for frying pans, but if I want to barter myself a cow I had better have a hell of a lot of shoes. The answer is a semi-numismatic coin: all the gold you can get while still retaining the benefits of a rare coin. The Swiss 20 franc coin and the French 20 franc coin [these days we call each such coin a franc, since it doesn’t much matter what their face value was in Switzerland or France all those years ago] are non-reportable; nobody knows you own them unless you choose to say so. They were not confiscated in 1933 and will likely be spared confiscation in the future for reasons outlined above. And each franc coin is .1867 ounces of gold, so there are five to an ounce. If you manage to hang onto a one-ounce bullion coin like the Gold Eagle, it will only buy you items that cost a lot. The ounce of five francs is divisible, portable, hideable and above all, spendable. I’ve invested in Swiss Francs and I encourage my clients to do so as well. You can eat neither gold nor paper fiat money. But paper always loses its value eventually, while gold never does. After the collapse of the dollar – which is just one element of a larger collapse that includes energy scarcity, climate change, and population overshoot – we will need community, skills, stockpiled supplies, hand tools, mechanical devices like bicycles, musical instruments, and (arguably) weapons. We will also need tradable precious metals in pre-standardized small units. 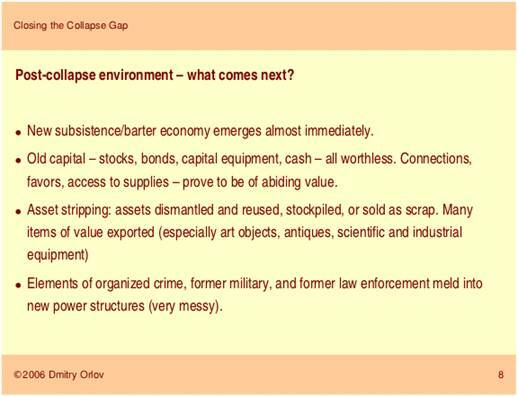 Gold will have different uses in the different stages of collapse, but it will always be a key ingredient of adaptation and preparedness. 1 Kelly Patricia O'Meara, "Missing Money Articles," http://www.solari.com/learn/articles_missingmoney.htm; "Treasury Checks and Unbalances,"